My great grandfather was part Crowe and he collected gemstones and rocks in Colorado. He cut and polished the stones and traded them with the Native American artists for pottery and jewelry. My great grandparents lived in Pikes Peak Colorado and my grandmother lived in Oklahoma. As a young child I spent my summers traveling between both areas so I grew up with the Native American culture and their traditions. Besides learning about the Native art culture, I learned all about their traditions, ceremonies and their herbs. I have always had a love for the herbs, their aromas and the meaning behind their use. Each tribe as well as each culture has their own use and meaning and we respect everyone for their use of the gift of herbs that nature has provided us. Today I work with many Natives in western states and support their businesses of gathering herbs and rolling them in to smudge sticks so many can enjoy the healing benefits of these herbs. The providers of our herbs respect the land and the plant itself and they leave the root of the plant in the ground so a new plant grows in the next season. We honor each plant as nature and know that the burning of the herbs brings balance, prosperity and new energy to our lives and to the universe. Choose a feather you feel drawn to or a feather from a bird you feel connected with as its spirit will be felt when you work with it. Quick short movements with a feather(s) breaks up blocked or stagnant energy, long flowing movements smooth out energy creating a calm, balanced and harmonious energy flow. 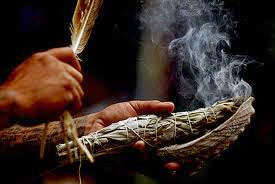 Smudging is the burning of sage, cedar, sweetgrass of other herb to cleanse negative energy from a room, person or aura.. To smudge a room, put the dry herb of your choice (sage is most commonly used) in a shell, clay pot or other non burnable container. Light the herb allowing it to burn for a few moments. Fan out the flames as it is the smoke of the smoldering herbs you want. Using a feather, walk about your room, house or person you are smudging in a clockwise direction fanning the smoke. Make sure you get the smoke up into the corners of the room as well. Open doors or windows to let energy escape if the area feels heavy or there has been sickness. Once you feel the smudging is complete, wait for a day or two, if you feel you need to smudge more then perform your ceremony again. You may then want to smudge with sweetgrass after a day or two. A general rule of thumb is sage is for clearing and healing, sweetgrass is for attracting new energy.